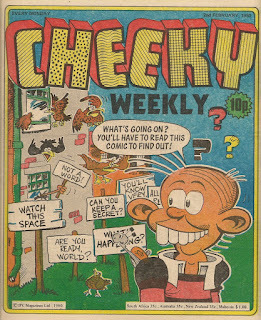 Cheeky Weekly cover date 02 February 1980 – the final issue. What’s going on? Well, from our perspective all these years later we of course know what our toothy pal doesn’t as the issue commences – this is to be the final edition of our favourite comic and as of next week a select band of Cheeky Weekly survivors will move into sister title Whoopee! At one time this news would have been heralded with a ‘Great News Inside Pals!’ banner on the front page but, as comic readers had become wise to the fact that merges weren’t in fact ‘great’, by the 1980s new strategies for imparting the bad news were being employed. On this occasion an air of intrigue and mystery is created, and even Cheeky himself doesn’t know what fate awaits him. Crystal Belle describes the forthcoming announcement as ‘tremendous’. The definitions provided by an online dictionary reveal how clever the scriptwriter is in their choice of adjective. As this is the final Cheeky Weekly, I’m going to focus on the final panels of all this week’s non-Cheeky strips. First up, Why, Dad, Why? concludes with Dad in detention. 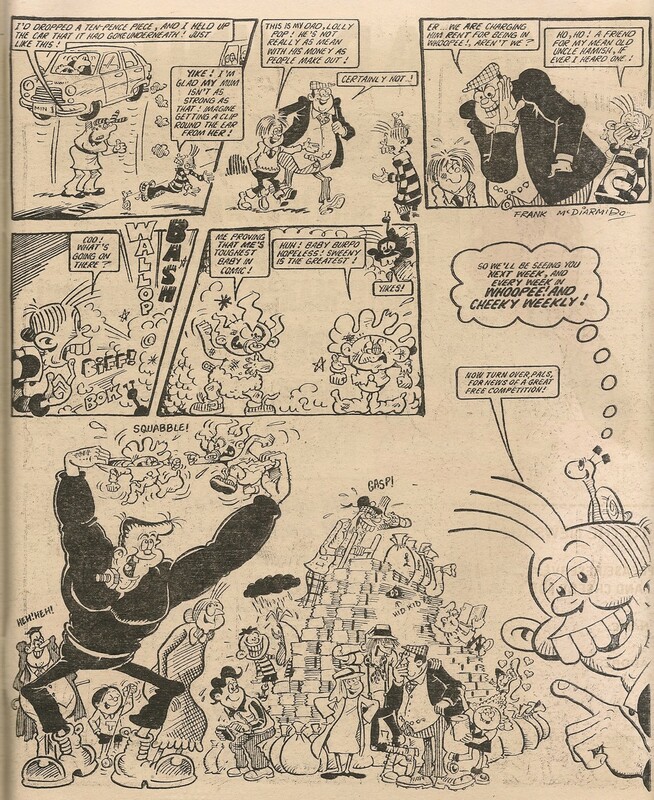 This feature, which used scripts originally written for Whizzer and Chips, but with new artwork, will not be among the Cheeky Weekly strips transferring into Whoopee!, although the inter-generational antagonism will resurface in the 1980 Cheeky Holiday Special and Annuals dated 1981 and 1982. The Stage School kids hasten, with a 'Titter' and 'Chortle', to their showbiz class having avoided a threatened whacking. This is not the last we’ll see of the young entertainers as they’ll survive the upcoming merge and will also give performances in the 1980 and ‘81 Cheeky Specials and Annuals dated ‘81 to ‘85. An offensive stereotype appears in this week's Ringer Dinger story. In the late 70s this kind of portrayal was regularly encountered in the media. Fortunately the shocking image is absent from the final panel which I'm able to present here. 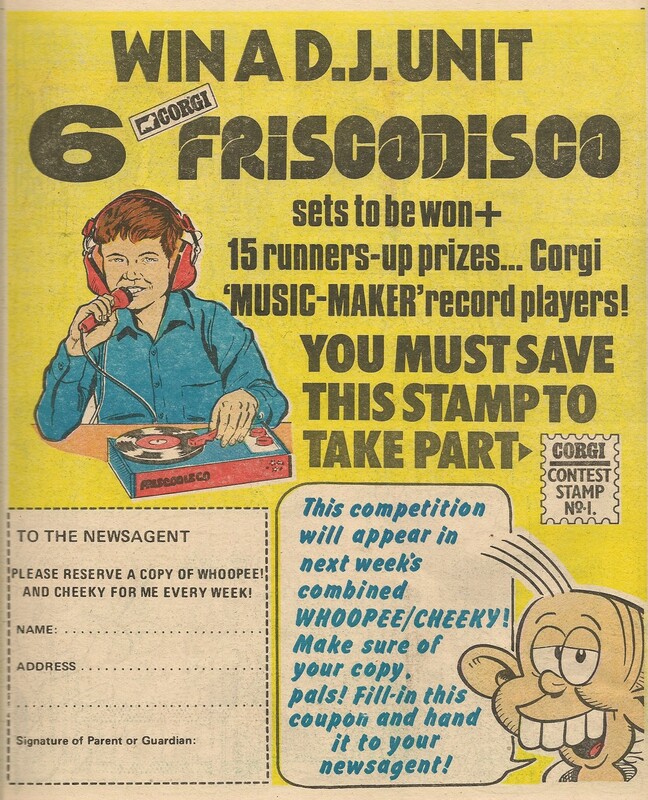 The Ringer Dinger reprints from Whizzer and Chips will not carry over into Whoopee!, although the teeny telephone tearaway will dial-in appearances in the Cheeky Specials dated 1980 and 1981 and the Annuals dated ‘81 and ‘82. Snail of the Century is displaced from its usual back-cover location, but retains its regular Snail-wryly-observing-goings-on-in-the-Cheeky-household conclusion. An untitled, cut-down version of Snail of the Century will transfer into Whoopee! and some months after that comes to an end the mirthful mollusc will be lucky enough to secure another strip all to himself. Cheeky’s slithering sidekick will of course continue to accompany his toothy mate in the Cheeky strips in their new home. However fans of SotC will be able to enjoy Snail on the Beach (a holiday version of the strip) in the 1980 Holiday Special, followed by A Snail’s Tale and Snail Abroad in the 1981 and 1982 Summer Specials respectively. The 1981 Annual will feature a Snail of the Century, while those dated 1982 and ‘83 will each include Smile-along-a-Snail (SotCs in all but name), and Snail Down Under (another SotC variant) will appear in the Annual for 1985. Elephant secures employment as a butler this week and ends the Elephant on the Run strip having yet again seen off The Man in the Plastic Mac. At the end of the final episode we’re none the wiser as to why our elephant pal is being pursued, and since the peripatetic pachyderm will not survive the imminent merge, we remain puzzled to this day - the one further strip that appeared in the 1980 Cheeky Holiday Special provided no further enlightenment. 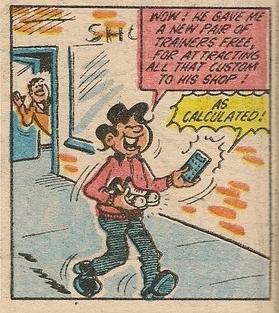 This week’s footwear-focused Calculator Kid tale ends with Charlie having received a free pair of trainers thanks to the silicon-chip stratagems of his number-crunching pal. 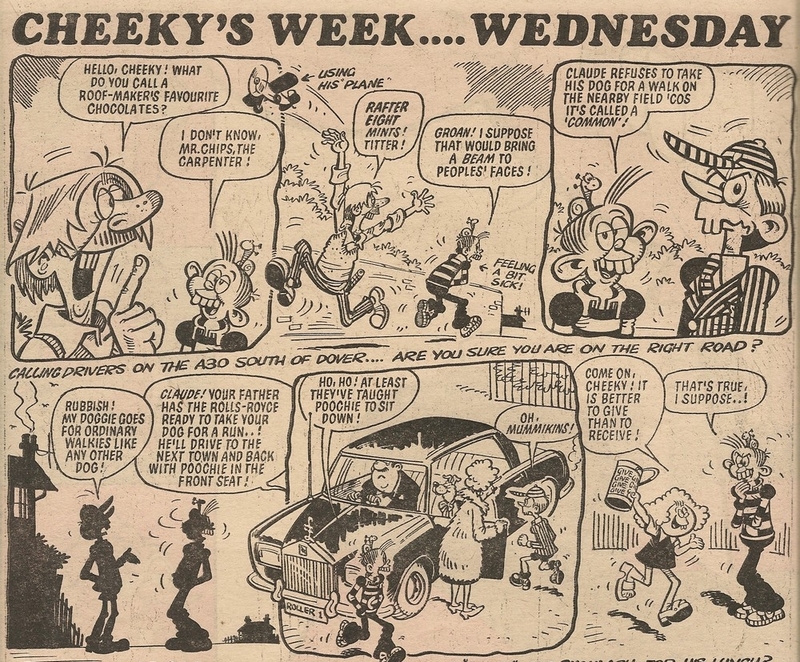 Charlie and Calc will be among the Cheeky Weekly survivors continuing in Whoopee!, and fans of the pair will be able to enjoy more of their adventures in the Cheeky Specials from 1980 to 1982, and in each of the Annuals from 1981 to 1985. Soggy the Sea Monster who, like Charlie and Calc is benefiting from the colour printing available on the centre pages, doesn’t actually appear in the final panel of his tale, in which the lovable leviathan teaches a lesson to a pair of inconsiderate water sport enthusiasts. Soggy, whose Cheeky Weekly run consisted of reprints from Shiver and Shake, will not continue into Whoopee!, but will make a bumper 5 aquatic forays into the 1980 Holiday Special and enjoy a single adventure in 1982’s Summer Special, plus appearances in the Annuals from ‘81 to ‘83. 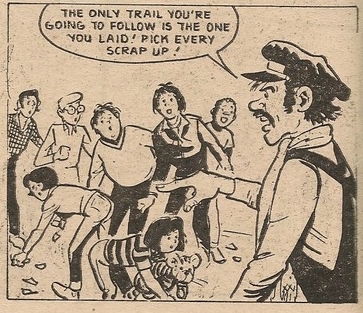 The Gang (a retitled reprint of the Double Deckers from Whizzer and Chips) subject us to a tedious tale involving a paper chase (another of those things that only ever occur in comics, never in real life). Fortunately, this underwhelming feature will fail to make it into Whoopee!, although it will return to haunt the Cheeky 1980 Holiday Special and the 1981 Annual. 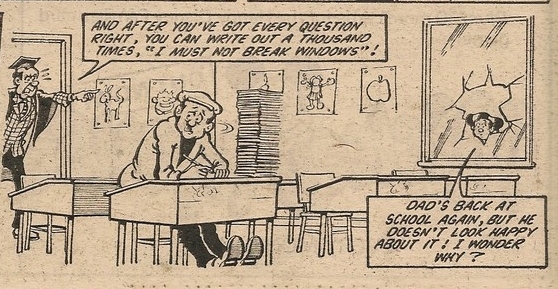 The strip that brought the original Double Decker run to a conclusion had actually been reprinted in Cheeky Weekly dated 28 July 1979 – see Raven’s comment here. Tub is rewarded for his inadvertent cat rescue, something which pleases his usually-irascible dad. 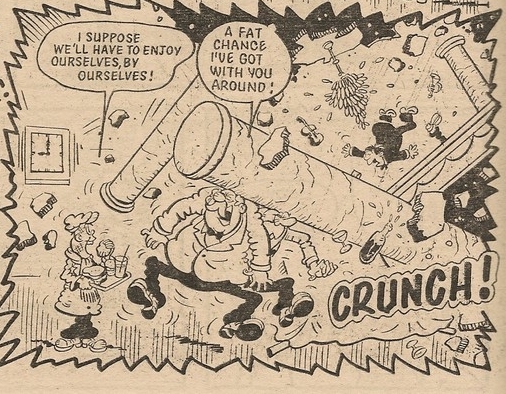 Our portly pal will not lend his weight to the band of Cheeky Weekly folk making the transition to their new home, but will return in 1981’s Summer Special and Annuals from 1981 to 1984. The corpulent cove will also make a surprise appearance in the 1983 Shiver and Shake Annual. How did that happen? Mustapha Million challenges a bully to a fight, but by offering his opponent access to the considerable range of gym equipment and fitness facilities available in Mustapha Mansion, at the time of the contest the bully is exhausted. Thus wily Mustapha wins by knocking his opponent down with a feather (not a wet fish as the illustration below might suggest). Mustapha will transfer into Whoopee! 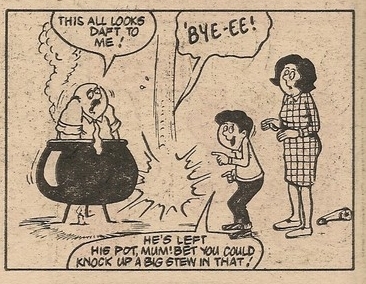 and will in fact become the longest-surviving Cheeky Weekly character, withstanding several merges and appearing regularly (although for a period in reprints) until the final issue of Whizzer and Chips in 1990 - somewhat longer than the single year his father originally intended him to spend in the UK. Our middle-eastern mate will also appear in the Cheeky Specials from 1980 to ‘82 and Annuals from ‘81 to ‘85. 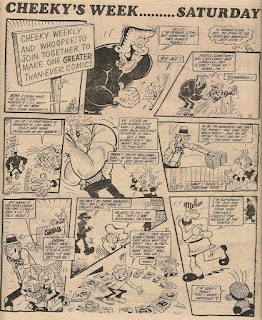 Cheeky Weekly’s next-longest-lived character, sharing the seven-figure titular reference with Mustapha, is 6 Million Dollar Gran, although the synthetic senior citizen underwent three rebrandings during her post-Cheeky Weekly career, ending up as the leader of a group of old age pensioners in a strip tiltled Gran’s Gang, a feature that survived until the final issue of Whoopee (which by then had been shorn of its exclamation mark) dated 30 March 1985. In her final Cheeky Weekly outing, Gran overcomes multiple difficulties while attempting to feed the local ducks. 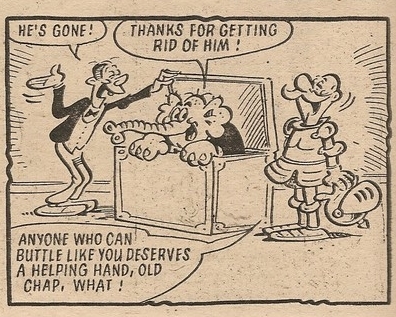 The aged automaton will have further adventures in the Cheeky Specials of 1980 and 1981 (in the 1981 Special her strip will be titled $6000,000 Gran to match the change in title that came into effect when she transferred to Whoopee! ), and the Annuals from ‘81 to ‘85 (strips titled 6 Million Dollar Gran, $6000,000 Gran, Gran, Granny and Granny respectively; In Whoopee! Her strip was retitled Robot Granny in May 1981, and Gran’s Gang in July 1983). 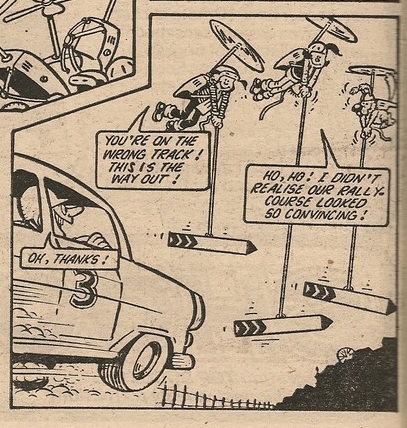 Speed Squad set up their own rally course but a driver mistakes it for the real thing and the plucky trio avert a disaster by guiding him out. Our high-velocity chums won’t survive the merge, but will enjoy accelerated adventures in the Cheeky Specials of 1980 and ‘81, and the Annuals from 1981 to ‘84. 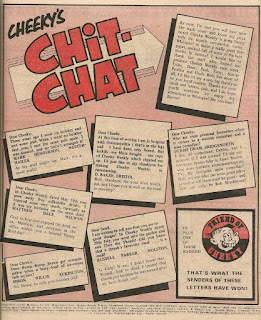 ...The Cheeky's Chit-Chat feature will not be forgotten next week as the Whoopee! 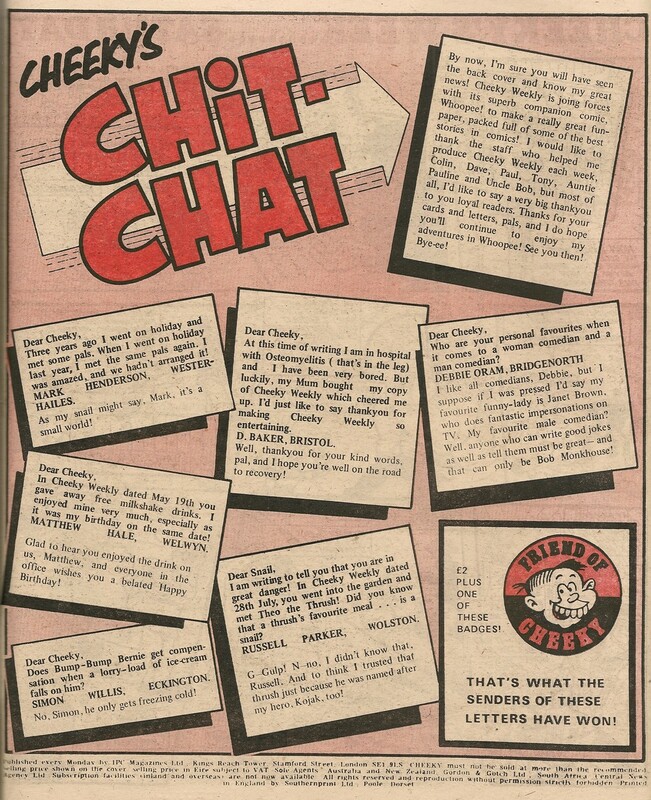 letters page will become known as Whoopee Chit-Chat, although letters will in future be addressed to 'the editor' rather than the toothy funster. The writers of letters printed in Whoopee! and Cheeky will continue to receive the same £2.00 award as did correspondents to Cheeky Weekly's letters page, but they will not receive the additional reward of a Cheeky badge (the Cheeky office obviously had a few boxes of Cheeky badges cluttering up the place at the end of the comic's run, as readers of the first issue of the combined title will be invited to write in to claim a free badge, 2000 of which will be up for grabs in return for an SAE). However, readers having a letter printed in Whoopee! and Cheeky will, in addition to their cash award, receive a Whoopee! whoopee cushion. The lucky band of characters who have been selected for transfer to Whoopee! are revealed on Saturday (except Paddywack who is absent from this final issue but will return in the merged comic). 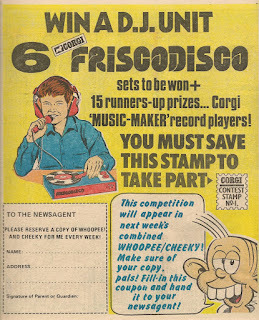 A competition is announced on the back cover, giving readers of the merged comic a chance to win a FriscoDisco junior DJ unit as an inducement for fans of the toothy funster’s title to transfer their loyalties to Whoopee! and Cheeky. And don't forget, after explaining to your parent or guardian that your favourite comic has been subsumed into another title, to hand the completed regular order coupon to your newsagent. It's great that Frank McDiarmid delivered all the Cheeky's Week artwork for this final issue - it's only fitting since his work was such a major part of the comic's success. And didn't he do a great job of drawing the Whoopee! characters? Excellent work from him, as ever. A very big THANK YOU Frank for your hard work throughout the comic's life and for all the laughs. Well, it's sad of course that our favourite comic has come to an end, but wasn't it a great run? 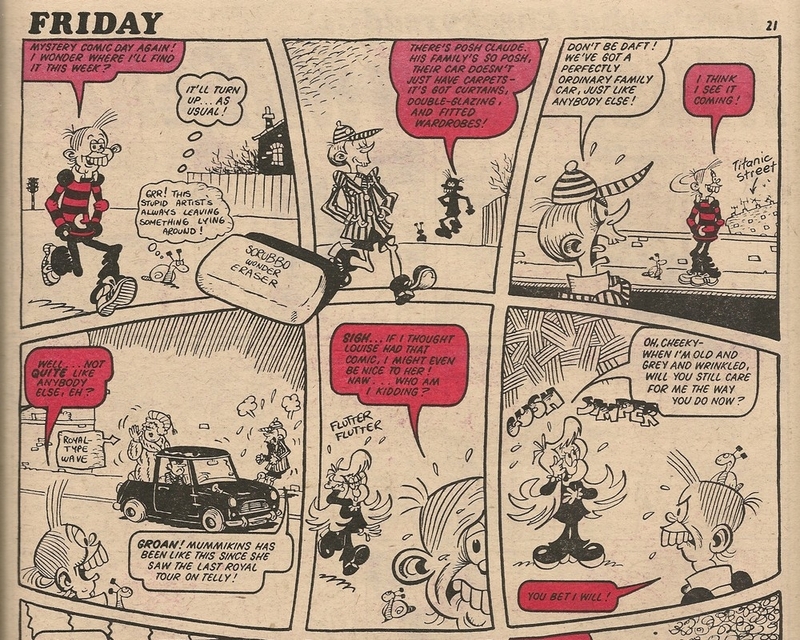 In terms of the number of issues, it's nowhere near the venerable Buster or Beano, yet Cheeky Weekly's 117 editions is more than some comics were able to manage before expiring. But what counts, as we know, is quality, not quantity, and quality was in evidence throughout Cheeky Weekly's run. 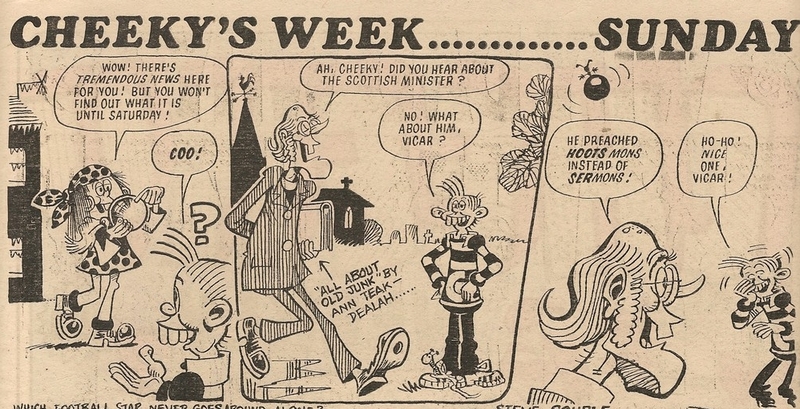 Frank McDiarmid stamped his personality on the Cheeky pages, and his wild, zany artwork and comments scattered around the sets just made the pages zing with irrepressible humour. The scripts by Willie (Gordon) Cook were imaginative, and the vast array of appealing, eccentric characters strolling the streets of Krazy Town elevated what could have been merely a succession of corny gags into a highly enjoyable romp through an often surreal version of late 70s Britain. 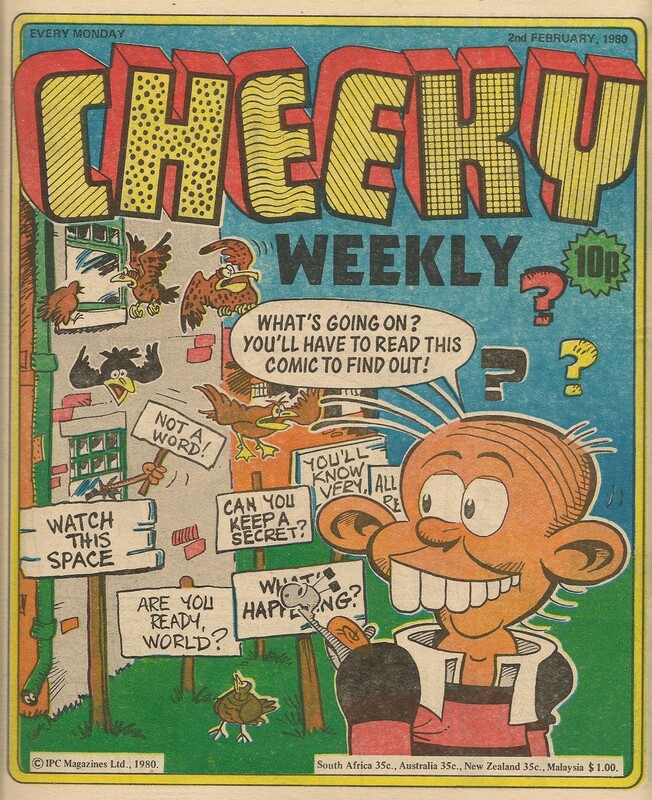 As we know, Cheeky Weekly emerged from Krazy, and inherited its progenitor title's iconoclastic approach to British humour comics. 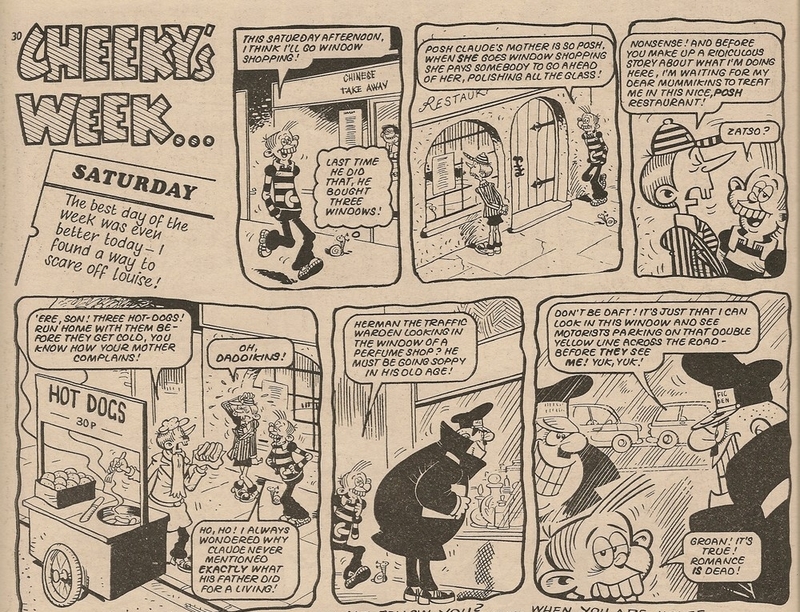 On its debut Cheeky Weekly had 2 main characteristics that set it apart from its predecessors; it was based around a single character who featured in multiple strips each week, and all the non-Cheeky strips were 'framed' by those containing the toothy funster and his pals. 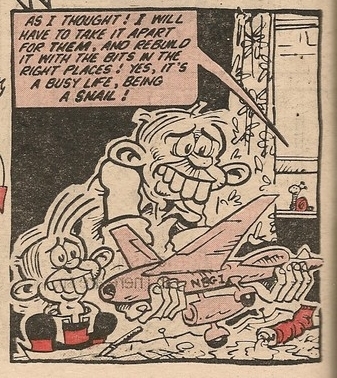 The extra care that had to be taken with the planning and placement of the features and their introductory sequences within the Cheeky strips made it evident that this comic was intended as something rather different from the grab-bag of unrelated comic pages of the typical humour/adventure titles of the time, and no doubt we have to thank IPC's group editor Bob Paynter for making all this possible. Sadly over time the framing devices were dropped, as were the adventure strips, but in its heyday there was no title to touch Cheeky Weekly. And as well as the framing devices, further trouble was taken to give us several special issues, such as the Skateboard, Disco and (one of my favourites) the 60-years-into-the-future editions. Then the metafictional Mystery Comic was introduced to make things even more interesting. 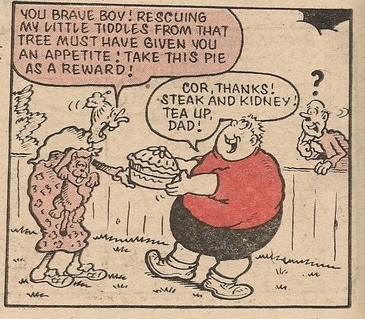 As mentioned in relation to Ringer Dinger above, derogatory stereotypes presented as 'entertainment' were sadly common in British society in the Cheeky years, to the extent that it wasn't uncommon for them to appear in children's comics. However, what was to become the comic's longest-survived creation was quite the reverse - a visitor who was generous, kind and eager to learn about and contribute to a culture other than his own - Mustapha Million. Mustapha showed us all how a diverse society benefits everyone. Much kudos to the enlightened creators of this lovely strip. How could it fail to be anything but a delight when the responsibility for illustrating the positive basic premise was entrusted to the mighty Reg Parlett. I firmly believe that Reg did some of his best work on young Master Million. Ian Knox's artwork on 6 Million Dollar Gran was another highlight - his often-grotesque visuals and cleverly-rendered humorous action scenes perfectly suited the immensely-powerful-(what-seems-to-be)-little-old-lady scenario and some clever scripts keep the fun bubbling along nicely. I'm even almost willing to forgive the frequent references to Gran's 'bionic' attributes! For me, Elephant on the Run was probably the stand-out non-Cheeky feature. 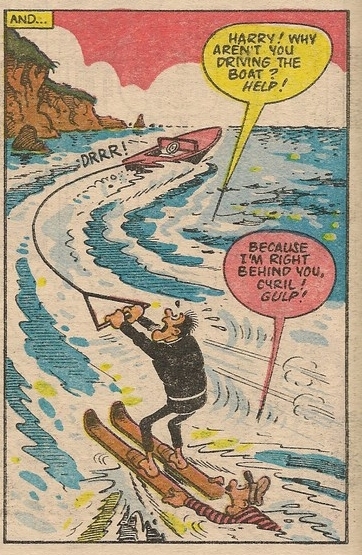 I love the utter daftness of it all, and Robert Nixon's depiction of the slapstick events is superb. So what if there was no proper conclusion? Maybe it's better we never found out why our tusker pal was on the lam. Disaster Des, Stage School, I could go on; Cheeky Weekly had more than its fair share of excellent content. 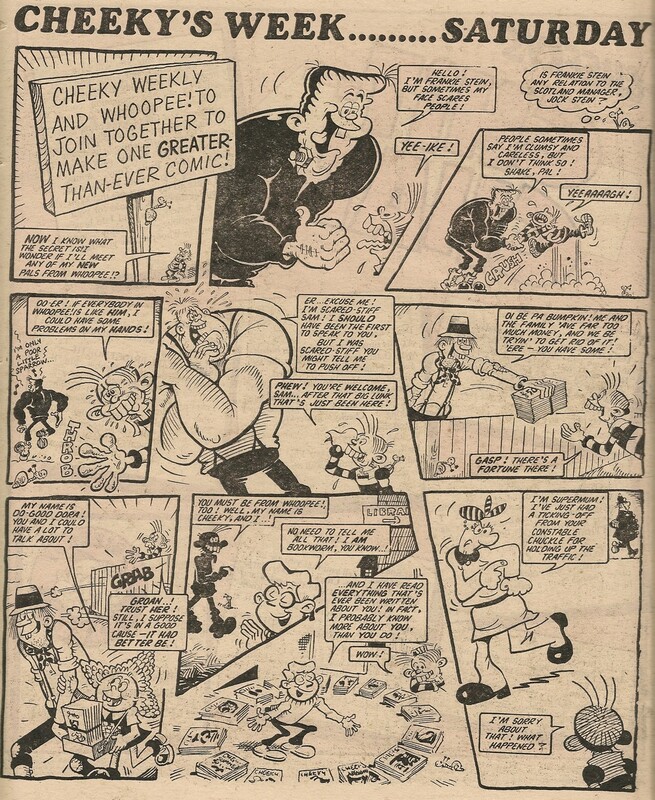 But let's not get too downhearted about the demise of our favourite comic, we've still got plenty of Cheeky-and-pals fun coming up in Whoopee! and Cheeky. Maybe Claude had a stepfather? 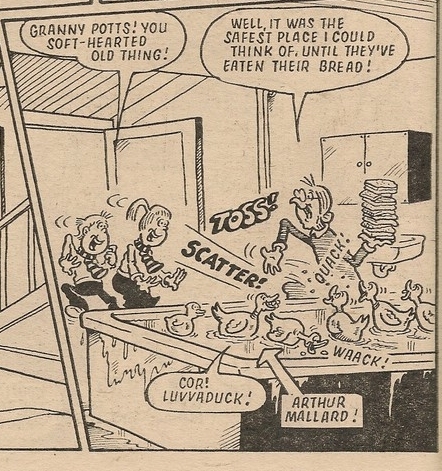 None of Claude's three parents appeared in the Cheeky pages in Krazy.